That's what this set is all about, and the two main projects focused on, (Cessna 310K and the Northrop T-38 "Talon") provide plenty of opportunities to show a variety of methods for creating them in modo. As with all of my other volumes, I want to make it clear that although I generally concentrate on aircraft, these techniques apply to anything else you want to model. It's about creating shapes that serve your needs, texturing them, rendering them, and setting up some basic animation, via modo 501's great new tools. 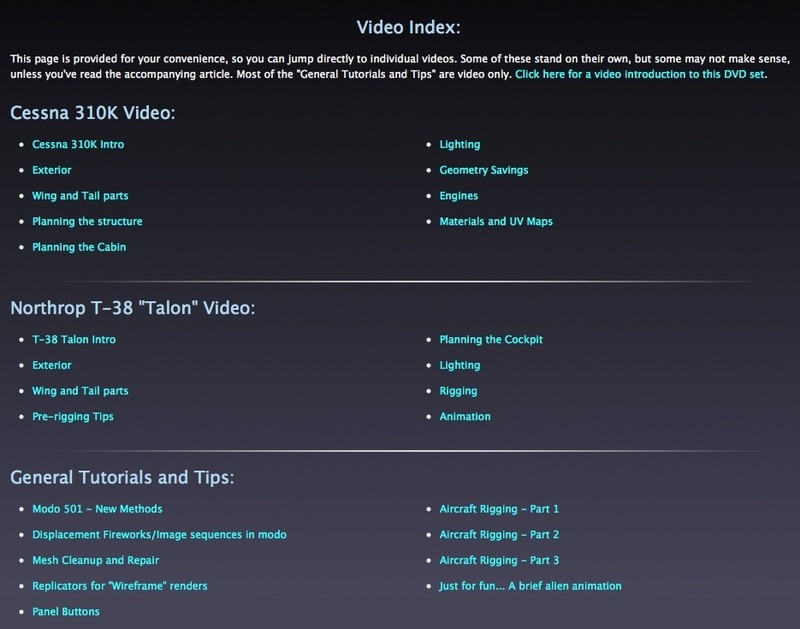 The (screen capture) video parts of the presentation are 1280 X 720, at 24 frames per second, with audio, and as with my previous sets, the rest of the content is set up just like a web site, so that you can navigate directly to any parts you like, in any order you like. There is an included "user_media" folder, containing several free models and scenes. And... It's not all "serious". Nothing wrong with exploring modo and creating something fun, too! Here's one example. The projects shown in this volume also include organic art visualization, some news, regarding modeling for rapid prototyping, simple texturing and UV-ing, rigging for animation, and compositing. Due to increased security by nearly all manufacturers, accurate documentation is more and more difficult to obtain. So, I'm also passing along the methods I use to discover and compare data from various sources, to create accurate scale models, when the documentation we'd like to have doesn't exist. We all have to "eyeball" things at times, and those familiar with a particular subject will instinctively know when it's right or wrong, so I feel that this part of the presentation is important. The Cessna 310K project was truly an "exercise in extrapolation". The featured modeling project on this volume is my "museum scale" version of the Cessna 310K. It's not only a scale exterior model, but, like my Cessna T-50 project, it features a detailed interior structure, cabin and cockpit details, interior and exterior lighting, and rigging of the control surfaces, using modo 501's new schematic view. At this time, this model has about 11 milion polygons, and the file size, including all the images used for textures, is about 60 MB. My Northrop T-38 "Talon" project is also included, and uses a different approach, concentrating on saving system resources. Still, it represents the T-38 accurately, and includes exterior lighting, rigged control surfaces, and a moderately-detailed cockpit. At this time, the model has about 1.5 million polygons, and the file size is about 13 MB. 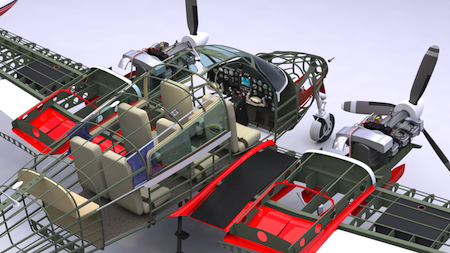 Aside from the lessons learned during the Cessna 310K and T-38 projects, I've included various tips that apply to all of our work, including lessons learned from using booleans extensively, the importance of working in the right mode, when scaling and moving parts, the use of modo 501's new "schematic view" for rigging, some fun uses for replicators, tips for producing better renders without using up your system resources, an interesting "time-lapse" magazine article I produced for an aviation client, how to use image sequences for animation-within-animation effects, how to archive your model for easier future improvements, several "power tool" uses of the background constraint, some beveling tips, and more. Credit is always appreciated, but the models and files on the DVD are yours to use as you see fit, with no restrictions. Enjoy!